Downtown Chicago is a joy to explore. A mix of parks and soaring skyscrapers, it offers a well-balanced appeal and has attractions for people of all ages. Among the best ways to take it all in is on a river cruise. Some of the river boat tours provide insight into the famous downtown Chicago architecture and even venture out onto Lake Michigan so passengers can enjoy unfettered views of the city’s impressive skyline. Of course, walking tours of downtown Chicago are also encouraged. Don’t be surprised if you keep getting distracted while trekking about, however, as this is one of the country’s best shopping cities. Chicago also has a reputation for its food, and the downtown restaurants can prove to be every bit as tempting as the downtown shops. It is little wonder that so many Chicago visitors choose to stay at one of the downtown hotels. These hotels are in the heart of the action and offer proximity to any number of major attractions, such as Grant Park, Millenium Park, Navy Pier, and the Art Institute. It isn’t all about location, however. The downtown Chicago hotels also offer a lot in the way of quality, and families in particular might be happy to know that there are plenty of downtown hotels with swimming pools. Examples of luxurious downtown Chicago hotels with pools include the Waldorf Astoria Chicago, the Trump International Hotel & Tower, the Four Seasons Chicago, the Ritz-Carlton Chicago, and the Hilton Chicago. The list doesn’t end there, and if you prefer something that is more reasonably priced, there are plenty of options to consider. One such option would be the Residence Inn Chicago Downtown/River North. Its amenities include a pool and the rates are rather reasonable. The same goes for such other downtown hotels as the Hampton Inn & Suites Chicago Downtown and the Courtyard Chicago Downtown/Magnificent Mile. Downtown Chicago and the many interesting neighborhoods that surround it are full of restaurants. These restaurants vary from fast food joints to fine-dining establishments and offer a vast array of cuisines between them. As a result, finding something to suit your taste isn’t difficult in the Windy City. Overall, the dining scene in Chicago is casual, and figuring among the foods that the city is most famous for are steaks and deep-dish pizza. The Loop, which is the core area of downtown Chicago, is known for its high-price restaurants. The same can be said for the Magnificent Mile & Gold Coast areas, which are in the immediate downtown area. That being said, there are plenty of more affordable eateries to choose from in these areas, including some fast food restaurants. Just west of the Chicago River, the up-and-coming West Loop neighborhood features some of the city’s coolest restaurants. Another area to focus on when looking to dine in the more immediate downtown Chicago area is the River North neighborhood. Within walking distance of many downtown hotels, River North’s numerous restaurants offer something for everyone. If you want to expand your Chicago dining horizons even further, it is worth venturing out to such other areas as Lincoln Park and Old Town, Wrigleyville & the North Side, and Wicker Park/Bucktown. These areas are within easy reach of downtown Chicago and are full of restaurants. 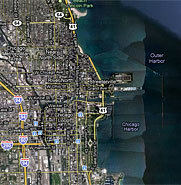 A downtown Chicago map shows that the city sits right on the shores of Lake Michigan. Two large urban parks extend along much of the lakeshore. They include Grant Park, which is downtown, and Lincoln Park, which unfolds to the north of the downtown core, also known as The Loop. This is where the city’s skyscrapers are concentrated. Among those skyscrapers is the Willis Tower. Formerly known as the Sears Tower, the Willis Tower rises to an elevation of 1,451 feet, making it the tallest building in the United States. One thing that you might notice when consulting a map of downtown Chicago is how the streets are laid out in a grid pattern. This makes the city rather easy to navigate. Should you need further help making sense of the city once you get there, you can pick up a map and get other information at one of the two visitor centers that are found downtown. These include the visitor center at the Chicago Cultural Center, 77 E. Randolph Street, and the visitor center at the Chicago Water Works, 163 E. Pearson Street.